Honeysticks Crayons are handmade in New Zealand from 100% pure New Zealand beeswax, so they are safer for children of all ages. This sustainable process causes minimal impact on the environment and gives the crayons a wonderful honey scent. Our unique chubby crayons are easy for small hands to hold, but much harder to break! Let your little ones express their inner artist with a stunning range of twelve eye catching, non-toxic crayon colours. Originals are fatter but shorter - good for little hands. As your kids grow older and can handle pencils then the longer thins are the better option. 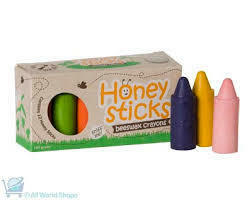 Honeysticks Originals - 12 Pack of Jumbo sized natural beeswax crayons designed for little hands. 12 vibrant long lasting colours: Purple, blue, black, ocher, pink, white, red, light-green, dark-green, orange, brown, yellow. Handmade in New Zealand from 100% pure beeswax and nontoxic pigments. Environmentally sustainable & low impact production method. Recycled packaging material. Honeysticks Thins - 8 Pack of thinner natural beeswax crayons. Encourages correct finger/hand grasps for writing in older children.